Why should I participate in market research? How do I participate in WMM studies? Here you can see how we conduct studies with our respondents & volunteers. We appreciate your time and insights. We reimburse our participants with anywhere between €25 – €250 per hour for participating in various market research projects. WMM runs market research projects to gather insights and ideas to help our clients develop and/or improve new products and or/ services. Participating in our studies means that you help us meaningfully create and/or improve products and/ services solutions. Consumer and experts who meet during our group discussions and testing sessions often share the same interests and end up building relationships beyond the time they spent together on our study. No advertising, no direct marketing, no sharing of your details, and all of the information you gave us will be kept confidential. For each participation, you will be adequately reimbursed at between € 25 to € 250 per hour. The registration is 100% free, without commitment and you junk mails. Extend your network! Meet interesting people in our group discussions and tests. Respondent Feedback. Daniel (29) from Berlin about his participation in a focus group in Berlin. Respondent Feedback. Carolina (35) and Lisa (8) from Hamburg about their participation in an In-Depth-Interview in Hamburg. Respondent Feedback. Kirstin (26) from Hamburg about her participation in a product test in Hamburg. Don't miss another research study. Download the App and off you go! ON THE MOVE, AT HOME, EVERYWHERE. With the new WMM app, current studies will always be updated so you won’t miss another opportunity, wherever you are. 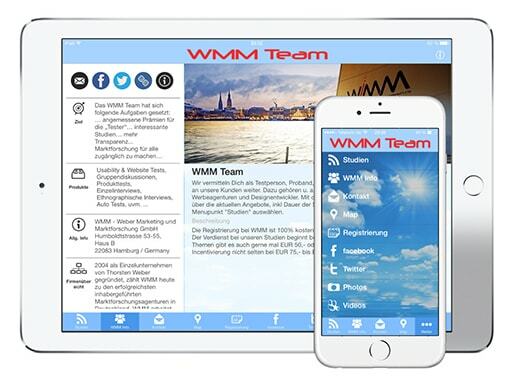 We, WMM GmbH, are a market research agency based in Hamburg, specialized in qualitative market research projects such as in-depth interviews, ethnographic research, group discussions, online communities, etc. We run market research projects to gather insights and ideas to help our clients develop and or improve new products or services. When you register you can be a part of our studies, registration is 100% free and without any obligation. You can choose which studies you would like to be considered for. We will inform you of your qualifying status, reimbursement (you can earn from between € 25 – € 250 per hour! ), and all other participation requirement over the phone and confirm it in writing. Our market research activities would not be possible without all of you, our test persons, participants, respondents, users, and volunteers. REGISTER today and be a part of changing the world! With 13 years of experience, we are now one of the most successful owner-managed market research agency in Germany. Over 120,000 respondents throughout Germany have already placed their trust in us! We guarantee the highest level of transparency and service thanks to comprehensive respondent support, and appropriate incentives and/or expense reimbursement. We are a member of the BUNDESVERBAND DEUTSCHER MARKTFORSCHER (THE NATIONAL ASSOCIATION OF GERMAN MARKET RESEARCHERS – BVM) as well as the international market research association, ESOMAR. These memberships ensure that we adhere strictly to industry rules and regulations as well as standard industry practice. We protect our participant’s information according to the German Data Protection Act, and others specified by the international guideline in market research and opinion polls. We also comply with all of the necessary security precautions – in most cases going above and beyond legal requirements. Click here for our Study Terms and Conditions.